Memorial Day weekend is a wonderful weekend to get the summer party started. If you’re planning on heading out for an RV camping trip this Memorial Day, we have found some delicious and camp-friendly recipes to kick of the season, and keep you and your friends and family eating well. One of our favorite sites to scour for camp-friendly recipes is campingcafe.com. They have tons of great recipes for the grill, the RV, or over the campfire, and it’s a great place to find some inspiration if you’re looking to try some new things. I mean the kids may be happy with a hot dog on a stick, but you can do better than that. We chose a few to share here that will surely be a great start to the summer grilling season. Enjoy! Make three or four openings in the top of the can with a bottle opener. Empty 1/3 of the beer out to make it only 2/3 full of liquid. Lightly oil the exterior of the can with vegetable oil. Wash chicken inside and out and pat dry with paper towels. Loosen skin and rub 2 teaspoons of dry Cajun seasoning (or your favorite grilling rub or grill seasoning) under skin. Cover the tips of the leg bones with tin foil to prevent burning. Set up gas or charcoal grill for indirect grilling. For charcoal grills, mound briquettes into two piles on opposite sides of grill. Light. 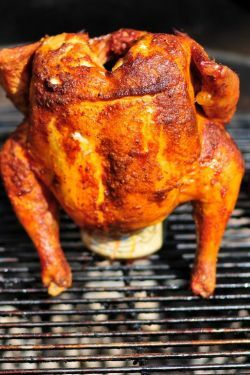 Heat only one side of gas grill, at a temperature of 350 degrees F.
Stand the beer can on an aluminum pie plate, piece of aluminum foil or special beer can chicken roasting pan. Carefully ease the chicken onto the can, and spread drumsticks away from the body to support the bird in a tripod position. 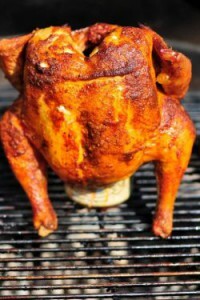 Add chicken, locating the bird between the two piles of charcoal on charcoal grills, or on the side away from heat on gas grills. Cover the grill and barbecue chicken over indirect heat for about 1 1/2 to 2 hours, or until the breast meat reaches 165 degrees F.
Remove chicken carefully, as there may be hot liquid remaining in the can. Remove watermelon from rind and dice into bite size pieces. Set aside in a serving bowl. Toss with feta cheese. Combine lemon juice, olive oil, mint leave, black pepper and a dash of your favorite hot sauce in a small bowl whisk together. Pour on watermelon and feta. Let sit refrigerated for at least an hour or overnight. Just before serving top with pumpkin seeds or pine nuts. Slide the marshmallow onto a skewer then add one to two caramel candies to the top of the skewer. Toast the marshmallow and wait for the caramels to melt over the marshmallow. When toasted, place the toasted marshmallow on an apple slice and top with a second apple slice. Want to share some of your favorite camp recipes with us? We love to hear from you! You can comment here, or share with us on our Facebook page!